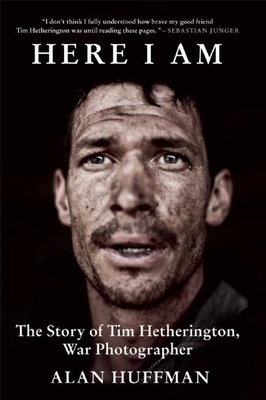 Tim Hetherington (1970-2011) was one of the world's most distinguished and dedicated photojournalists, whose career was tragically cut short when he died in a mortar blast while covering the Libyan Civil War. Tim won many awards for his war reporting, and was nominated for an Academy Award for the critically acclaimed documentary, Restrepo. Hetherington's dedication to his career led him time after time into war zones, and unlike some other journalists, he did not pack up after the story had broken. In Here I Am, journalist and freelance writer Alan Huffman tells Hetherington's life story, and through it analyzes what it means to be a war reporter in the twenty-first century. Huffman recounts Hetherington's life from his first interests in photography, through his critical role in reporting the Liberian Civil War, to his tragic death in Libya. Huffman also traces Hetherington's photographic milestones, from his iconic and prize-winning photographs of Liberian children, to the celebrated portraits of sleeping U.S. soldiers in Afghanistan. Here I Am explores the risks, challenges, and thrills of war reporting, and is a testament to the unique work of people like Hetherington, who risk their lives to give a voice to people ravaged by war. Alan Huffman is the author of the nonfiction books Open Season (with Michael Rejebian), Sultana, Mississippi in Africa, and the photo-essay book Ten Point: Deer Camp in the Mississippi Delta. He has contributed to The Los Angeles Times; The New York Times; The Washington Post Magazine; Lost; National Wildlife; Outside; The Atlanta Journal-Constitution; The Oxford American; Preservation; Smithsonian; and numerous other publications. He has also worked as an editor at VanityFair.com. He divides his time between Bolton, Mississippi and Brooklyn, New York.